People experiencing job burnout often resort to acts of sabotage, using gossip as a destructive force, says Aimee Cohen, author of “Woman Up! Overcome the 7 Deadly Sins that Sabotage Your Success” (Morgan James Publishing, 2014). Sometimes, gossip is merely a “diversion from what they’re supposed to be doing,” Cohen says. But at other times it serves as a cover-up. Feeling overwhelmed and underappreciated, burnout sufferers may become unreliable. They blow deadlines, come unprepared to meetings and fail to meet their usual high standards. As these sorts of self-sabotaging behaviors ramp up, they may speak poorly of others to make themselves look better, Cohen explains. Those who experience what Cohen calls “burnout with bitterness” are looking to sabotage others. “When that happens, typically you’re looking to take someone down with you,” usually because your target has imposed unrealistic expectations on you or subjected you to harsh working conditions, she says. Gossip then becomes a way to discredit the perceived tormentor. 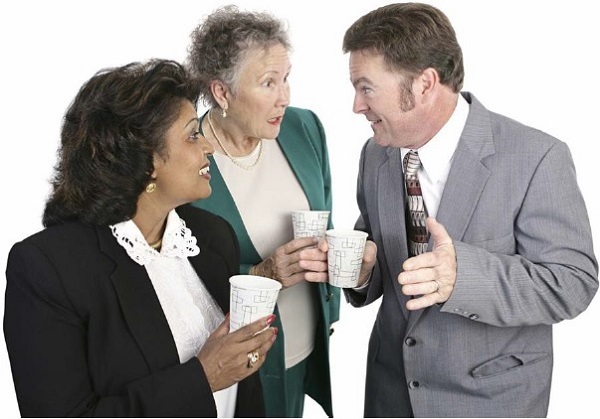 When gossip stems from a legitimate “gripe”, it builds a narrative around the complaint in which the teller is the put-upon good person and someone else is the bad person. But gripe gossip seldom if ever improves things for the good person. Others may agree with the gossiper that things are bad and shouldn’t be that way, but a misdirected complaint never gets resolved. Turn the complaint into a request and take it to the right person. Ongoing complaining and whining saps what little energy you have left, but requests produce results. Ask yourself first what the complaint is underneath the gossip. Has the boss assigned more work than you can handle? Are coworkers not doing their share and expecting you to pick up the slack? If you’ve got more on your plate than you can handle, instead of complaining to coworkers, ask your boss to sit down and prioritise what you’ll do now, what you’ll put off and what can be done by someone else, often, this process eliminates things from the to-do list altogether. Don’t be surprised if the source of your troubles turns out to be you. Your problems could be self-imposed. I call it the competency curse, always wanting to say yes, to lend a helping hand. Men as well as women, we tend to overextend ourselves,” Cohen says. You may need to follow a series of red flags back to your underlying complaint, and even to the realisation that what you’re experiencing is burnout. “No one likes to admit they’re burned out because we all want to be the superhero with endless capacity and drive,” Cohen says. Gossip or any other behaviors that are out of character are red flags, including a short temper, trouble remembering names, misplacing things and sleeping through the alarm. “Everyone has a finite bandwidth, and these are all signs that we’ve exceeded it,” Cohen says. When the red flags point to self-imposed burnout, recovery starts with clarifying your career goals. Once those goals are clear, it is easier to turn down work that does not bring you closer to achieving them, Cohen says. To regain control and credibility, list all your unfinished work and missed deadlines, and schedule time for each to-do item. Get it down on paper. It’s too overwhelming if it’s just in your head. Experiencing burnout does not necessarily mean it’s time to change jobs, but if expressing your concerns to the right person doesn’t improve your situation, it may be best to explore other options. Find out more about how Executive Life Coaching can help.